While Tricia Thunder fights his way aboard Mecha-8, Ryan Rock does same inside Mecha-9, but things look way more complicated for him! After the success of Mecha-8 I feel like it had enough material to continue the game and in a serendipity, Luc Miron from Team Pixelboy told me he had space to publish one extra Colecovision game. So why not Mecha-9? Mecha-9 has aboard the strange Time Slip. Screen filled with enemy bullets. Six levels of intense action. Six bosses with the sole objective of making cosmic debris from Mecha-9. 256K cartridge for Colecovision or 128K for MSX. 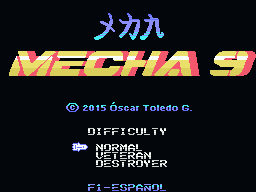 Mecha 9 for MSX is available with Japanese language integrated in game. This traslation was made by B. Shigeru @gcshigeru and PSS K.
Mecha 9 was available in the 48th MSX user's meeting in Barcelona, Spain in December 5, 2015, all copies sold out in 30 minutos, and now you can get Mecha 9 thru Matra boutique. For Colecovision it's available since February 22, 2016 through Team Pixelboy and now the ROM is freely available for download. It has got extremely good opinions from players "hardware pushed to the limits! ", "looks even better than Mecha-8! ", "I've enjoyed inmensely the Mecha series! ", "the most polished homebrew game I've seen". Chronicle of the 48th MSX Users' Meeting by Retromaniac Magazine (Spanish). Chronicle of the 48th MSX Users' Meeting by Gamemuseum.es (Spanish). Chronicle of the 48th MSX Users' Meeting by Alberto de Hoyo (Spanish). Great video of Mecha-9 running over a real Colecovision. 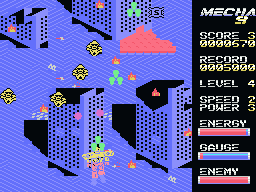 Tony Cruise playing Mecha-9 for MSX.